Jeremiah Woodvine (1908 - 1986) and Joseph Woodvine (1910 - 2003) circa 1911. 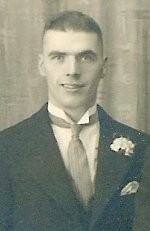 Joe was born 8 July 1910 at 2 Wool Court, Burnley. He died, 25 May 2003 at Lower Ridge, Belvedere Road, Burnley. 7 May 1938 at Holy Trinity Parish Church, Burnley. Left to right - Ben Leaver, Margaret Lord (Cissies daughter), Halstead Leaver, Joseph Woodvine and Ada Leaver (bride and groom in the middle), Jack Leaver - who gave Ada away - and Margaret Woodvine. Jeremiah Woodvine and Francis Comstive wedding, 1934, St. Mary's Parish Church, Burnley. From left to right ?, Joseph Woodvine (1910-2003), Jeremiah Woodvine (1908-1986), Franics Comstive (1907-1988),?, ? This was also taken during the war, might have been on leave so I think this was taken in Burnley?. Joseph Woodvine (1910 - 2003) is in the back row (wearing the overalls, and flatcap). Joseph Woodvine and Ada Leaver married 7 May 1938 at Holy Trinity Parish Church, Burnley. Joseph with his wife Ada and daughter Elaine. Remarks: Very Keen and was improving much. Not yet up to standard. Stoker Rating. Employment and Ability Record. December 1943 – Employed in Engine Room for Watchkeeping at sea and Boiler Bricklayer in Harbour (Satisfactory, Stoker 1st – Good Bricklayer) – Hastings.